Oh boy! It’s time to get excited! ‘Why?’ you ask. Oh, geez! You haven’t heard! You have no idea what’s coming your way! Well, here it is: Everything Summer Camp is proudly introducing our coolest trunks yet—new this year—Designer Trunks. 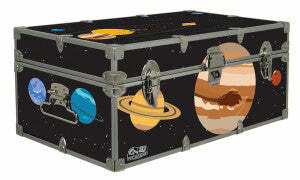 Unafraid of originality, Designer Trunks feature customizable designs sure to grab everyone’s attention! With over 100 options to choose from and more being added all the time, we’re guaranteed to have a design that delivers your wildest desires. Imagine your camp trunk covered in colorful patterns like Chevron Insignias, Anchors Aweigh, Space Odyssey, Lucky Clover, and SOOO much more! Constructed the same as our mo st popular Happy Camper Trunk, we swap out the steel for a durably-laminated and dazzling high-definition print. The high definition print comes off of our giant, wide-format printers and is then laminated for nearly indestructible protection. It’s then applied to the trunk before the hardware goes on. Like all of our other camp trunks, we cover the interior with DuraWrap Liner which is water-resistant, odor-free, and virtually tear-proof while the bottom of the trunk is covered with our traditional steel exterior. Once complete, Designer Trunks are more durable than paint! You haven’t seen the likes of this trunk before. They certainly look cool on our website, but when your own arrives on your doorstep, these stunning creations are likely to floor you. Cool, colorful, and totally YOU, get your Designer Trunk right here! Summer camp outfitters like us kno w how much our customers love to make their camp trunks into their own creations—works of art. That’s why Everything Summer Camp has conceived of, what are clearly, the coolest camp trunks with spectacular colors and awesome designs. So get excited! Check out our awesome, new Designer Trunks on our main site and find one to fit your style. As always, thanks for reading.